From Broadway and Times Square to 5th Avenue, Disney has a major presence in The Big Apple. In Manhattan, Disney sites include the World of Disney Store on 5th Avenue, Broadway shows, Times Square ABC Studio, The New Amsterdam Theater, and ESPN Zone. More NYC photos by ASD from this trip are here! ASD photographed five ESPN Zone locations over the years. See: Anaheim, Baltimore, Chicago, Las Vegas and New York City. 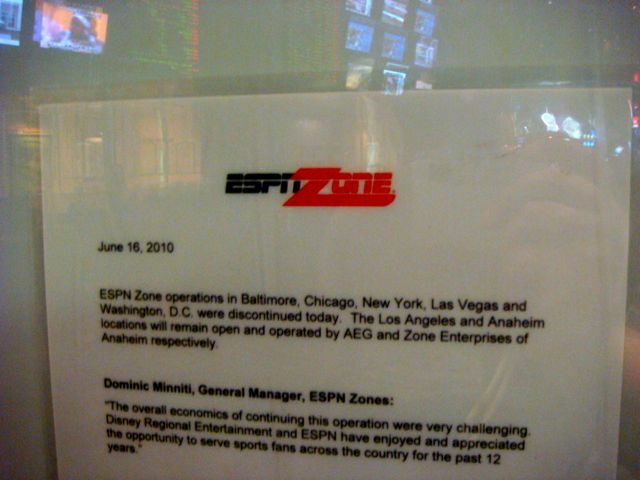 all of the ESPNZone locations closed on June 16, 2010. ASD has also photographed ESPN Club at Disney's BoardWalk, Walt Disney World, Florida. As of ASD's last visit in August 2013, ESPN Club remains open.